Additive manufacturing or “3D printing” has come a long way since originally introduced in the 1980’s as a method to conveniently create prototype parts out of plastic.. Additive manufacturing can now be used with various materials including metal and ceramics, giving injection molders an alternative process for building parts. With new, highly sophisticated 3d printers for metal printing, the ability to print metal, three-dimensional parts from a computer aided design (CAD) file has become cost effective for both prototyping and some production environments. While startup costs can be high, the convenience of additive manufacturing with the added potential of volume production is forcing traditional fabrication shops to change their mindset about the role of 3d printing, and the technology is being embraced by major manufacturers like GE, Honeywell, IBM and others. Additive manufacturing capabilities are maturing, providing high volume manufacturing options to various industrial processes, including metal injection molding. 3D printers today are manufacturing parts faster than ever before, with the capacity to fill furnaces quickly thus requiring a large capacity furnace for high volume production. Metal injection molding companies have long been familiar with the use of CM furnaces in the finishing of metal parts.It turns out that the finishing of 3d printed parts is very similar, requiring post formation processes that will both purify and harden metal printed parts. Typically these processes include debinding and/or sintering to remove binders and gases that finalize the size and hardness of the product. Debinding is required to remove most of the binder that chemically bonds the metal powder throughout the molding process. Upon completion of the debinding process, the resulting part is about the same size but typically 20% less dense than the original part, and will usually change from a greenish tint to a typical brown metal color, similar to what is observed in the finishing of injection molded parts. After debinding, the metal parts will be ready for sintering and moved through the sintering furnace. The sintering furnace will precisely control the temperature to remove any remaining binder and gases, and sinter the parts to the final part specifications. Many parts will shrink during this process depending on their material properties. Metal additive manufacturing can produce a wide variety of parts composed of various metals including Copper, Brass Bronze, Nickel, Silver, Aluminum, Stainless Steel, Manganese, Chromium, Titanium, Aluminum Oxide or even Ceramics. CM Furnaces manufactures a wide selection of high performing furnaces used in precision manufacturing operations around the world. All our equipment is designed and manufactured in the USA and we’ve been a leader in production furnace manufacturing for over 70 years. We provide sophisticated yet flexible solutions to some of the most challenging metal injection molding and metal additive manufacturing processes in the world. We have a furnace to suit your application no matter the material, the temperature profiles, or the size of your production run. For batch processing in the lab or light production environments, our CM Rapid Temp series of box and tube furnaces, can accommodate a wide range of temperature and atmosphere requirements, from 1200° through 1800° depending on your material properties and part specifications. These furnaces can be either front or bottom loading and come with sophisticated programming options as well as high quality Kanthal heating elements. For real production environments, variations of our CM 400 series continuous furnace, have long been a go-to solution for medium to high volume MIM production environments. With multiple heating zones, atmosphere sealed chambers, and sophisticated thermal profile automation, there are almost no requirements these workhorse machines can’t be made to accommodate. 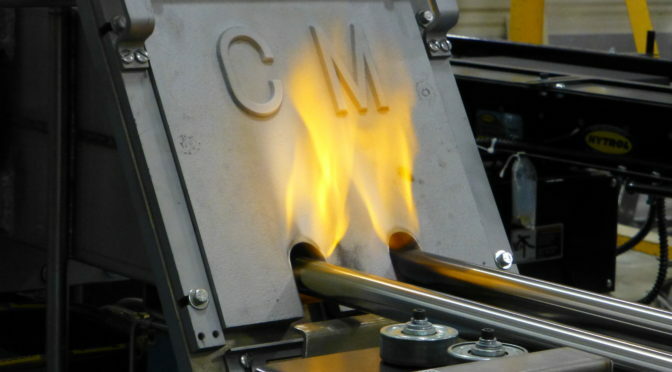 CM Furnaces has been manufacturing furnaces in the United States for over 70 years, satisfying customer specifications with high performance furnace equipment since 1946. Our machines help OEMs realize cost savings through efficient heat treatment of large scale production parts. The core value of our company and our products is quality, and you will find only the most durable and robust design choices inside our furnaces. Contact us today to speak with a knowledgeable technician about heat treating your additive manufactured metal parts for low or high-volume production. Visit https://cmfurnaces.com for more information.